Toothbrushes harbor a host of harmful bacteria that can re-infect your mouth when you brush. 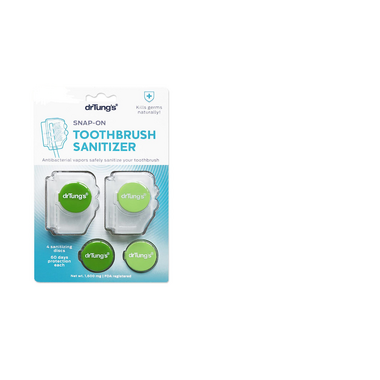 Dr. Tung's Snap-On Sanitizer is a REVOLUTIONARY product that releases all-natural, anti-bacterial vapors to kill germs and safely sanitize your toothbrush between brushings. Bought this mostly for traveling. I have found that many toothbrush models do not fit nicely into the traveling tubes from either having a thick handle (like some junior toothbrushes) or being too long to be able to fully close the tube. They (the tubes) get gross and are hard to clean. These snap-ons fit on any brush and take less space in my travel case. Seems like a pretty nice product I'm not sure how much it works because you can't even tell but the product is still worthwhile. Love that my toothbrush is always covered and kept away from other germs and peoples toothbrushes. Excellent for travel as well. Enjoy that it comes with additional sanitizing discs. Unsure if they truly work but I find comfort knowing it's always covered regardless! Great way to travel with your toothbrush or to keep it germ free at home. Simple design but effective. Toothbrush tastes fresh when using after being in pod. I have no idea if it's actually sanitizing, but it's a great cover and keeps my toothbrush nice and clean. I love this tooth brush cover ! I've always used the plastic ones from the dollar store but they'd always get disgustingly dirty after a short amount of time. Ive noticed that this one doesn't leave all that residue or any for that matter. And weirdly enough I find the snap it has once you've put it on, a tad amusing/comforting ( that thing is going no where ) ! I LOVE these covers and have used them for some time. I was especially happy to find them at Well.ca~ Many people keep their toothbrushes on the vanity or in a holder on a wall. Most people do not realize that each time a toilet is flushed, the particulate from the water can travel as much as six feet or more...not a comforting thought. I always use these covers , always. They are also great for keeping a brush in your bag or for when you are travelling. I highly recommend them and am so happy Well has them. It is slightly flimsy at the seam. But, fits my electric Oral B toothbrush well and stays on!